Sturdy black or gold anodized diamond-embossed aluminum handles. Comfortable rubber grip with elastic stretch cord. Strong 1/2″ aluminum hoops. 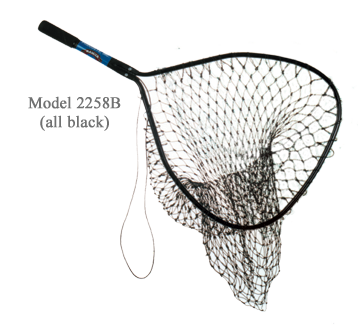 Models 2258 and 2258B feature a heavy-duty 1-1/4″ handle, heavy-duty 5/8″ hoop and strong salmon netting.